Cliff and I go on date night pretty frequently (at least a couple times a month). But every once in awhile, those date nights turn into work nights. By work nights I mean sourcing trips. We can't help it! We enjoy the hunt, it's fun for us 🙂 The thrill of finding something spectacular that is going to make huge profits! We usually start out with no plan of looking for inventory, but if we start doing the “I don't know, what do you want to do”, we turn that into “Want to go make some money?”. Now, as I write this I realize it could sound really bad to someone who isn't familiar with our business. We shared this in our Amazon Boot Camp Facebook Group and quickly realized that we are not alone in the Date Night Hustle mentality. Especially amongst the sellers who have both partners working the business. That is just super cool in my book! How Date Night Turned Into A $12,000 Score! Ok, now let's get back to the story on how we turned date night into $12,000. I'll start off by saying that we did NOT spend $12,000 to do it. We decided to visit one of our favorite Liquidation Stores. It's been about a month since we've been there so we figured it was ripe for the picking. And we were right! There were are few really awesome items that night. One of which will probably take us a year to sell through! I may need to back up just a bit. Our favorite way of sourcing is buying discount products from local liquidation stores. These are stores that buy “pulled” inventory from manufacturers and retail stores like Costco and CVS. Then they get sold in discount stores for a fraction of what they cost originally (often 50% or more off). If you've been to a Grocery Outlet or Big Lots, this is very similar to what we visited. We get great deals using this strategy from the chain stores too. But tonight we went to a one of a kind, mom and pop type store that doesn't have multiple locations. When we source from stores like this, it's really like looking for a diamond in the rough. We scan way more items than we pull the trigger on. Many of the products in the store are not appropriate for reselling, because they are either expired or damaged. So in a huge store, we only came out with 3 products that we wanted to purchase. We found about 10 items that had margins around 50%, but we were looking for large quantities. That just fits our business model better right now. But, if we were needing to spend a certain amount of money we would have bought a few more items. On this night we purchased 3 items that had great margins, and a good quantity available. I'll share the details about them below. Lotion Selling For $80 For A 3 Pack! The first item we got was some lotion that is selling for $79.99 a 3 pack. This particular line has been discontinued and is hard to find. We paid $4/bottle so a cost of $12 for the 3 pack. We purchased 22 packs total. The profit per pack is $49. Not bad for some lotion! Turkey Brine Selling For Almost $40 For A 3 Pack! The next item we got was some Turkey Brine that is selling for $37.97 a 3 pack. This comes out yearly, but is seasonal. We paid $1.50/bottle so a cost of $4.50 for the 3 pack. We purchase 9 packs total. The profit per pack is $21.50. Would you think that buying 9 packs of something would be “worth it”? And The BIG Money Maker! Discontinued Tea Selling For $15 A Box! Now the product that makes the whole trip worth writing about. 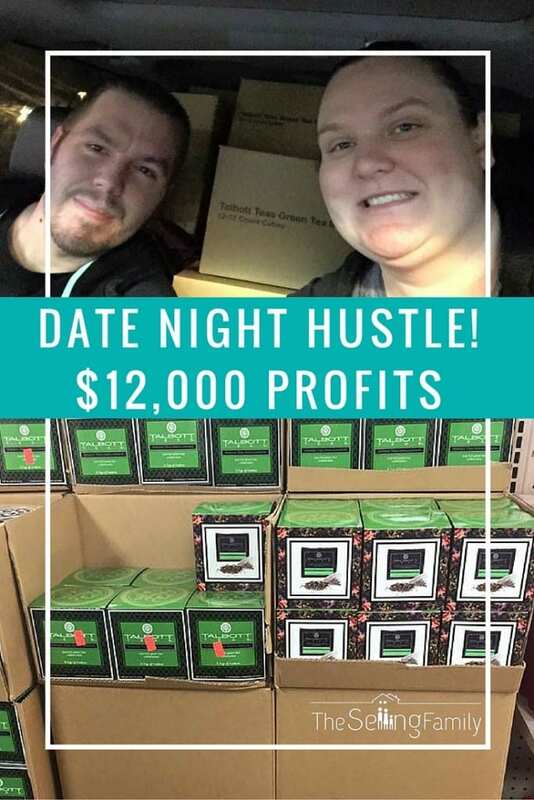 We found a pallet of tea that is selling on Amazon for almost $15 a box. We will be selling these in 2 packs to get a higher profit margin. $15 a box probably seems like nothing. But when you are talking about making over $8,000 off of a purchase it is in more perspective. Our cost was only $1.25 a box. Talk about awesome profit margins! It's buying quantities of great finds like this that make the hunt so worth it. If these sell for a year, it could bring in almost $750 a month for a full year. I share more examples like this one in our recently updated Liquidation Gold guide. 3 finds like this a year can mean making a couple thousand dollars extra a month, and not having to source inventory again all year! Of course, we still keep hunting for inventory, but when you don't want to make or work a lot, you can do it easily with liquidation. We paid $1.25/box. We purchased 1104 boxes of this tea (552 - 2 packs). The profit when sold as a 2 pack at $30 is: $19.95. The reason we are going to sell these in 2 packs is because the customer gets close to the same purchase price, but it will increase the profit over $1,000 extra. So, as you can see, our date night turned into a profit potential of $12,283. The total we spent on this trip was $1684. As we sell through the different items we will be sure to update with the actual profit seen. The tea will most likely take us about a year to sell through. Which is common for large purchases like this. We try to get a few of these per year. The more the better obviously. But, full pallets worth buying aren't everyday occurrences. If this type of sourcing seems like something you would like to try out. Check out our newly updated Liquidation Gold guide. This sourcing is done locally at stores, not online. If you don't have the one of a kind stores like we do, remember these same strategies apply to stores like Big Lots and Grocery Outlet. For those, we just never get the quantity all from one store. But we drive to multiple locations to see the same results! Read all about it in our guide today. Love the info! When you purchase single items to sell as packs, how do you package those before shipping to Amazon? I understand we can’t make a new multi pack listing, only use the ones already created but curious about the prep work to ship them out. Thank you for all the great information and inside tips and tricks. Makes things much easier and less frustrating for us newbies! Is your FBA business model the same today (1st day of 2019, HAPPY NEW YEAR!) as it was at the time of this article? I am new to the FBA game, and I want to hear from you as to whether you think us newcomers are too late to make it! Hope to hear back from you! Glad dot see you getting started! Thanks for sticking with us for so long. I live in a very small town and I am worried about being able to find products. Is it possible to find them online? We don’t recommend doing liquidation online. Hi Jessica! Thanks for all the good tips. I’ve purchased and read your Liquidation Gold but still haven’t been able to do any sourcing just yet because I’m still waiting for approval from Amazon to sell in these categories. Just a quick question, do you scan to check for items on Amazon using your phone’s camera or do you have a dedicated scanner for that.? We have a scanner, but many times we just use the phones camera. So after purchasing the bulk amount, you ship that to Amazon? If it is a big # of items we will keep some back, and send in more as we get low in stock. Hi Jessica! 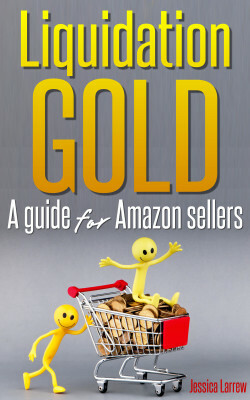 I bought and read Liquidation Gold and loved all the great information! I found a few liquidation stores in my area and started visiting today. The first one I found has some good finds however they write the price of the item in black sharpie somewhere noticeable on the box, sometimes on the barcode. Have you experienced that? I am guessing that is a no, no for sending to Amazon? Thank you! What all can you sell right out of the gate? Also, what does it take and how much out of pocket and storage to get started? I haven’t purchased Liquidation Gold yet because I am a mom of 2 and my husband is not a fan of selling stuff. Plus I hate to waste the money if there may be some reason why I wouldn’t make use of the info! When you buy a big quantity like that do you send in a little at a time to avoid Long Time Storage fees? Some MF and some FBA? I’m confused because you talk about selling the Tea as a 2 pack. I thought we could no longer multi pack grocery items that are already listed on Amazon. Hoping this makes sense. I heard Amazon stopped allowing sellers to do different quantities because it was flooding the catalog. Amazon has changed their take on Multipacks over the years and it used to be ok to create multipacks. The listing we used was already created on Amazon, not one created as new. Hi again Jessica. On your blog post about getting approved In restricted categories you suggest that we keep submitting to get ungated even after we get denied but in this post you suggest to stop until Amazon decides what they want. What has changed your mind? Thank you so much for your help. I appreciate it so much. I was just wondering how you handle bookkeeping when shopping at liquidation stores. I have a store in my area that I go to quite often. Most of these stores don’t have scanners because the inventory is always changing. The receipts just have qty & price so basically it seems like you can not “prove” your actual expenses if need be. I’ve never been audited so I couldn’t say what they are looking for, but we just keep the receipts for everything that we purchase. You could write the ASINs on the receipt if you wanted to. I would definately check with your CPA on how they recommend keeping those records. Thanks for checking in. Amazon has made changes in the way that listings are created with multi-packs. I don’t create or recommend creating multi-packs any longer. As far as the lotion and the tea go, they have been on Amazon already so I’m not creating them. The policy says not to create a child listing with a different quantity if it isn’t manufacture packed that way. The older listings were created differently, when Amazon allowed people to add quantities with the same UPC. The calculation you had done does not reflect Shipping cost or any other cost, So what do you suggest for shipping as we are in process to start the Amazon business, shall we keep FBM or FBA or Retail Arbitrage. Hi Tim, the calculations do include inbound shipping fees. I used Scoutify for the calculations at $.50/lb. You just rewrote this course, yet it says Copyright 2015 (btw, so do most of your website pages). Is that correct? Is this the up-to-date version? Looks like I’m not so good on the tech side of things 🙂 But it is definitely just finished. Why do the copyright years need to be the same year? Seriously doesn’t make sense to me! In your new guide, do alot of the products you mention require ungating in certain categories? My concern is when I purchase the guide, can I apply the info immediately or, would I need to go through all the certain approvals before I make the purchases? I understand Amazon currently wants supplier PO’s for grocery, health & beauty,etc. What percentage of restricted product categories are included in these liquidation warehouses? Thanks for all your help. Thanks Jessica for your quick response! I will definitely buy the guide. I also enjoy all your free info in your emails. You are so easy to follow and understand. On the tea, I see its sales rank is about 170K. Do you really think it will all sell in a year? Other than that, great find getting a batch of tea at a liquidation center with such a long expiration date still on it! Hey Steven, The Tea has ranged in rank to much lower and has gone in and out of stock. So I am pretty confident in it selling, especially since there aren’t many sellers and it is discontinued. Do you have to do any type of prep other than labeling on the multipacks you bought? Just poly bagging them and labelling. This is a set stickers and expiration date stickers. Hi Jessica! What a great date night! My husband and I love sourcing together even on date night! I was just about to fill out the application and send in 3 receipts for the Beauty, Grocery and Health /Personal Care. Are you saying to not apply right now? Can you give me more details on why not? Hey Cindy, You can apply, it doesn’t hurt anything. But most people are getting told no more receipts and some are being told invoices some are being told purchase orders. They just keep changing what they are telling people. It’s frustrating for those applying. I would have thought the Turkey Brine was in a glass jar. Is it in plastic or have the rules changes about the size of glass jars allowed? Don’t you offer the updated version “free” for those that purchased the original? Yes absolutely, if you login at the top right corner of the site, the new download is already in your members area. Great post! My wife loves doing arbitrage dates with me. I’ve been meaning to get your liquidation guide, so I’ll definitely take you up on the offer! I’ve got it! And there’s lots of useful info I can put to use…such a helpful guide. Thanks Cliff and Jessica! Hi Laketa, glad you enjoy the guide. If you didn’t just get it today, make sure to download the new version. It is in the members area already. I haven’t started my business yet, but I was at my doctor’s office today and he was selling all his supplements–about 200 bottles–for $3/each. Many have a retail price of $30. If they are not yet expired, are these something I can sell through Amazon? Or are they restricted? I will go back and buy them all! This sounds like a great deal if they are not expired. The only thing is that if you are brand new, you would be restricted from selling them. The beauty category is restricted, as well as health & personal care and grocery. How long am I restricted? How do I become unrestricted? You would need to request approval from Amazon. They are being really picky with those 3 categories right now and I am suggesting that people just not apply until Amazon makes it clear what they are looking for. Thank you for the info. I will wait until I’m more experienced before I try to sell these types of products. Another thing to consider is that many times Dr’s sell supplements that are purchased through MLM or Network Marketing companies. There are companies that do not allow their products to be sold outside their own marketing plans. This is something I would explore also. That’s a great point JaDeen. I wasn’t aware that is how they get stuff. It surprises me that they use MLM type products. Just courious what would it take to get into a restricted category? I need to gain entrance into the clothing catergory, but being new, when? For clothing you need to provide Amazon with a “flat file” and images that meet their criteria. We have gotten new sellers approved through our service with no problem.